Fluffy clouds of August puff out their chests in a brilliant blue summer sky. Constantly changing sculptures of form and volume, they are a sky show that mustn’t be missed. We planned an early lunch yesterday at Shabusen at Ginza’s major 4 chome intersection in order to get our visiting son to his afternoon flight on time. 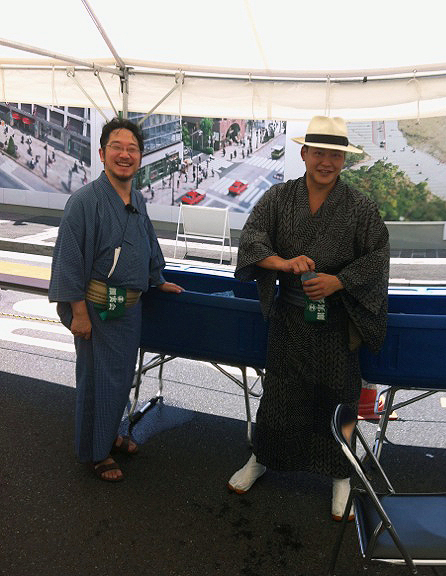 By luck we found a stage show being set up as we saw a nostalgic Japan returning to its origins with food carts and men walking in straw hats and yukata, tents with beer and soft drinks were being set up where you could drink up and cool down, or simply sit in the shade and enjoy the scene. 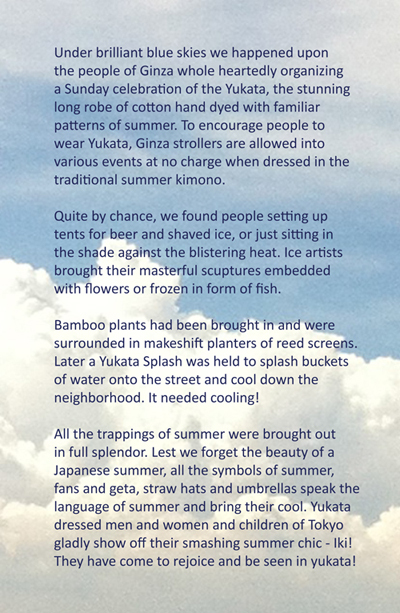 In times before air conditioning and electric fans, ice was a savior and still is in Ginza’s entertainment area where ice trucks come with their saws and saw big chunks of ice for their customer bars or the ice artistes who form huge objets of ice – fish, rabits, dragons and even encase flowers within the giant transparent blocks of cold. IKI is Edo chic – the dashing style of people of the Edo period who flaunted their flair in unexpected clothing combinations and accents and splashes of surprise. Subtle textures and materials – this one a gossamer hemp fiber for his yukata instead of the usual cotton – are only seen by a few who appreciate the intricacies and complexities of Japanese textiles and craftsmanship. This man seemed pleased when I noticed. No apparent restrictions on length. 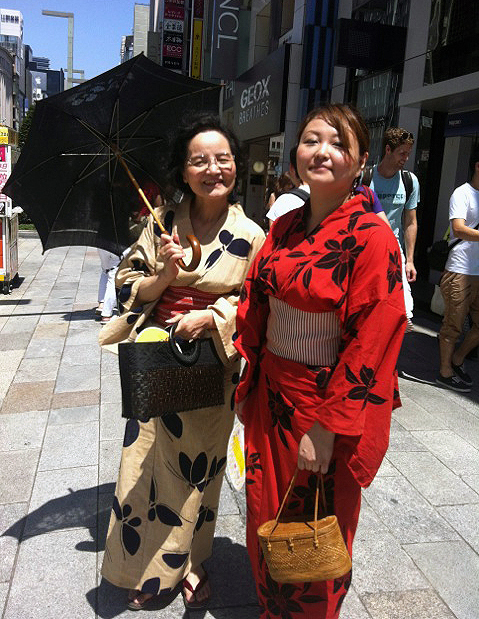 Wearing Yukata is an opportunity to express your other self – a bright flamboyant and why not self that more conservative western clothes do not encourage. Summer is the time to let go and bloom. 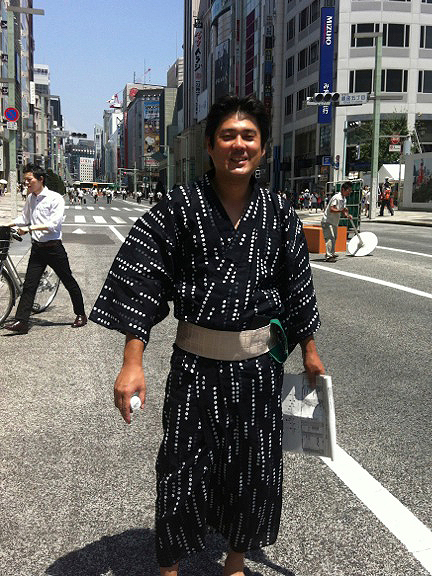 Yukata may just be a vehicle for the inner self to stand out and say something. It is certainly a blue and white light for stepping out and enjoying life! Starting young, feeling proud, even little boys love to dress up and join the fun of a summer celebration. Something special for all ages. 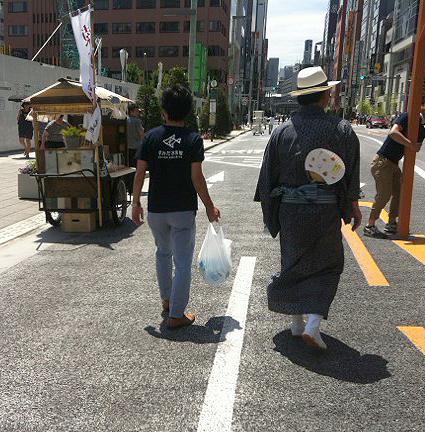 Japanese seem to step into their own character when they wear Yukata. 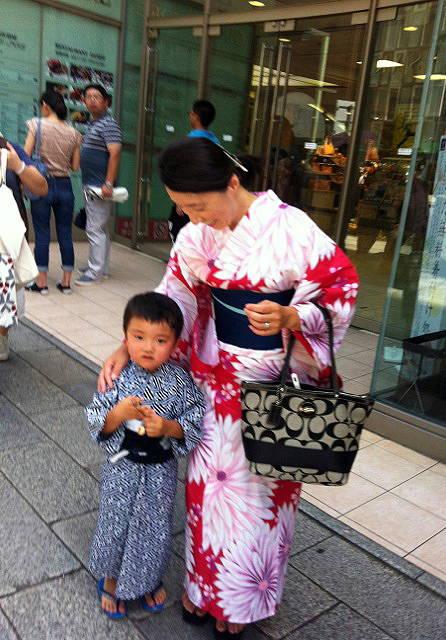 There is something bright and breezey about Yukata and their patterns and spontaneous color combinations. These days colors are flamboyant and all over the spectrum. Young girls seem to prefer the most colorful and gaudy patterns. 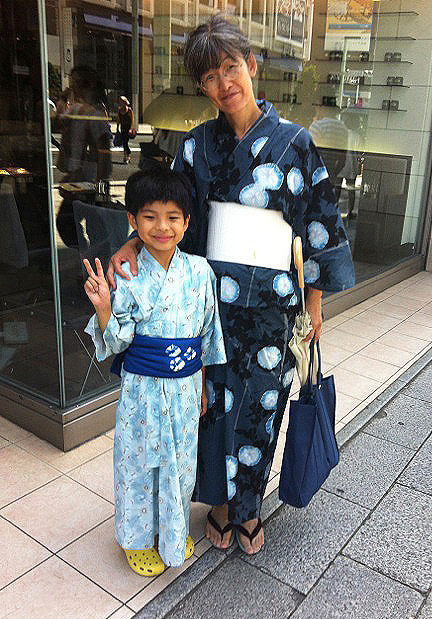 Needless to say, we search out the classic blue and white combinations and this Mother and son confirm its staying power. The blue is a coolant and together with white they are crisp and fresh even on the hottest of days. The ancients knew what they were doing when they chose blue and white as the natural order of things. It is natural. It is grounded and its simple understated dignity is supremely suited to the quiet Japanese state of mind. Blue and white also gives patterns a chance to make their own statement without letting colors take over the show and disturb the honesty and clarity of the design. Just off Ginza a family is gearing up and taking turns taking photos of eachother. Each one has his own style. 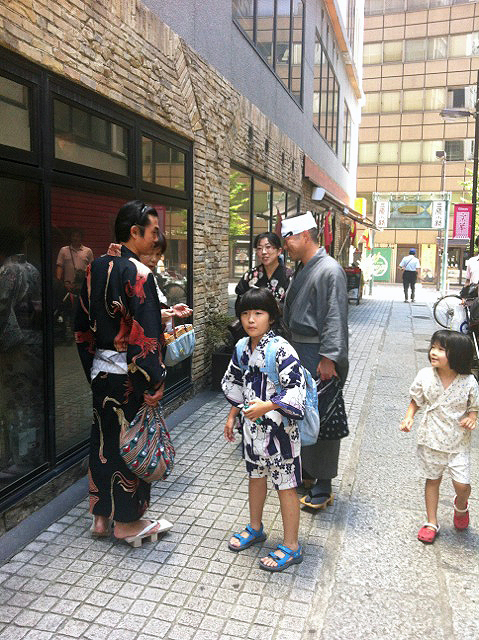 Yukata chic in all its various forms. They were all having a grand time getting ready to make their full family debut on the Ginza stage just coming together on Ginza 4 chome, one block away. 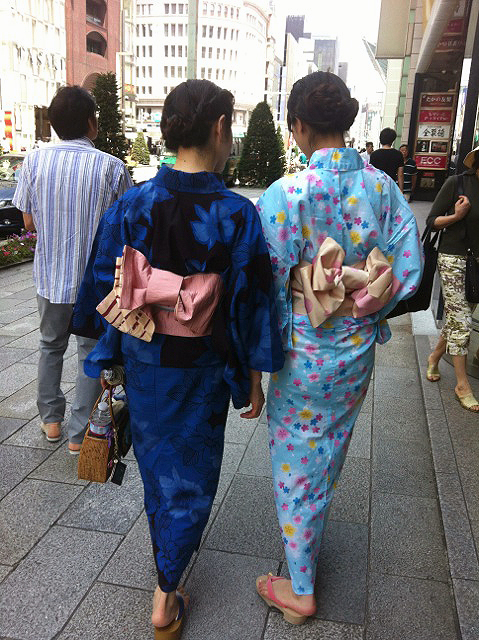 With Yukata, and Kimono as well of course, it is always best to have a look behind. Not only are there slim and narrow shoulders, but the bottoms are also good! and the way the obis are fastened there is always worth studying. There are innumerable ways of tying an obi and often the knots and bows and twists that you find are surprising and fun and original. You find IKI where you are least expecting it. 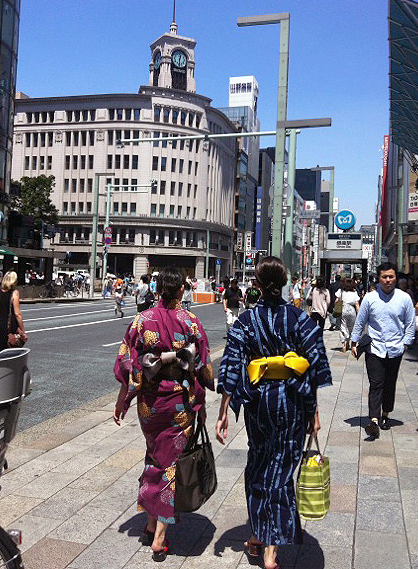 Ginza is more Ginza when it is wearing Yukata. 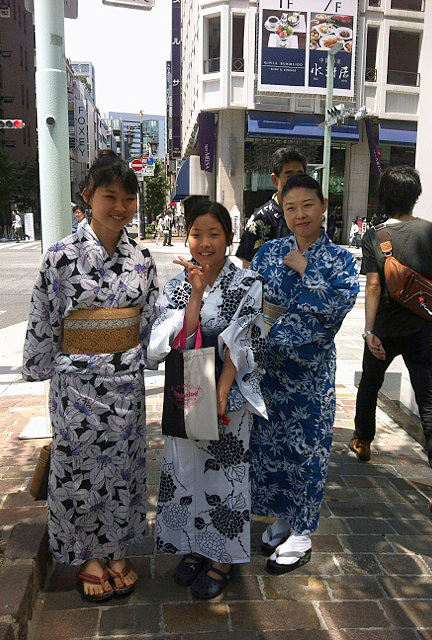 Japan is more Japan when it wears Kimono. All are more beautiful when they are Blue and White. yes, yes, yes and hai, hai , hai. Wakata yo! Always amazes me how culture is treasured and vibrant here. 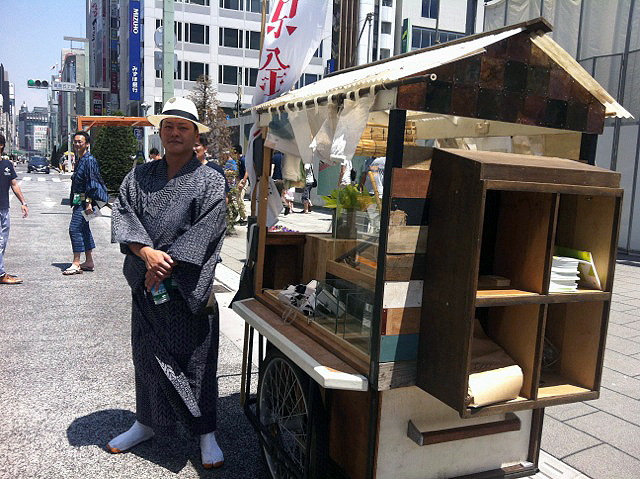 Particularly in summer, it’s hard to miss a matsuri (festival) or two. Refreshing to view from afar. I would like nothing better than to be a part of these environments. Come and spend some time here. We’ve got lots to show you – close up. 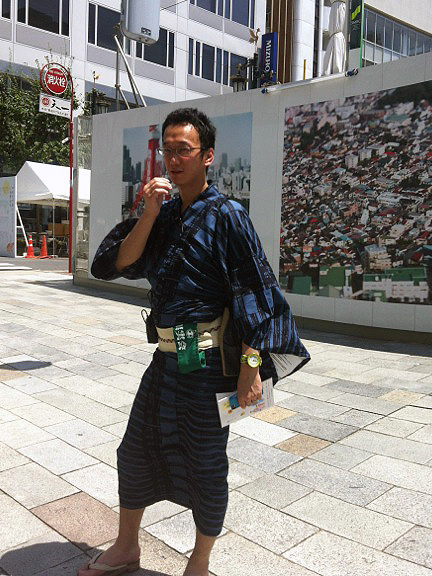 no doubt about it – yukata is at is best when blue and white! We’re on a beautiful team. 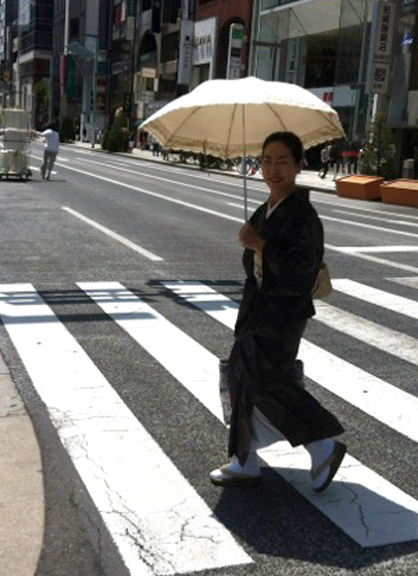 Thank you Susan, Again, I wished I had “looked More” during our years in Japan. Blue and white is my favorite, but I’m loving the flowers here too as a second favorite. Loved my visit to your store last week. I asked about next years calendar and was told to send an e-mail. I am wondering if I have the right e-mail adress as I have had no reply.